A big mouse pad is good. So it follows that an absolutely enormous mouse pad is better, right? Gamers, creative types, and general desktop PC enthusiasts seem to agree. Here are the best on the market for all your massive-mouse-pad needs. There aren’t a whole lot of variables to consider with these “desk mats” or “desk pads,” as they’re sometimes called. People often opt for them to protect the finish of their desktops (like a nice wood or tempered glass), but some users just like the feel of a big mouse pad and an even surface with their keyboard. Some of the most dedicated gamers want a massive surface area to take advantage of the hyper-sensitive lasers in their gaming mice. There are a few desirable features to consider, however, like an anti-fray stitched edge or the option to machine-wash the mat if you should spill a drink. Here’s our top picks with those key features highlighted. Aukey has been making a name for itself in the mobile and PC spaces with dependable, thrifty accessories. Their oversized mouse pad is no exception. At 900 by 400 millimeters (just a little shy of 36 by 16 inches), it’s more than wide enough to handle a big mousing space, your keyboard, and a few knicknacks above them both. But what really makes the XXL mouse pad stand out is its low $15 price tag combined with a wide array of features: a neoprene surface for water- and stain-resistance, a stitched edge to keep the fabric from fraying, a rubber underside to keep things stable, and the option to machine wash it if you’re less than tidy (and let’s be honest: tidy or not anything you use as much as a mouse pad needs a good cleaning now and then). The styling is flat black so it should fit in with just about any desk decor, and at 4mm thick it doesn’t skimp on the material. Aukey offers a two-year warranty on the mat itself, something that’s pretty rare in this space. 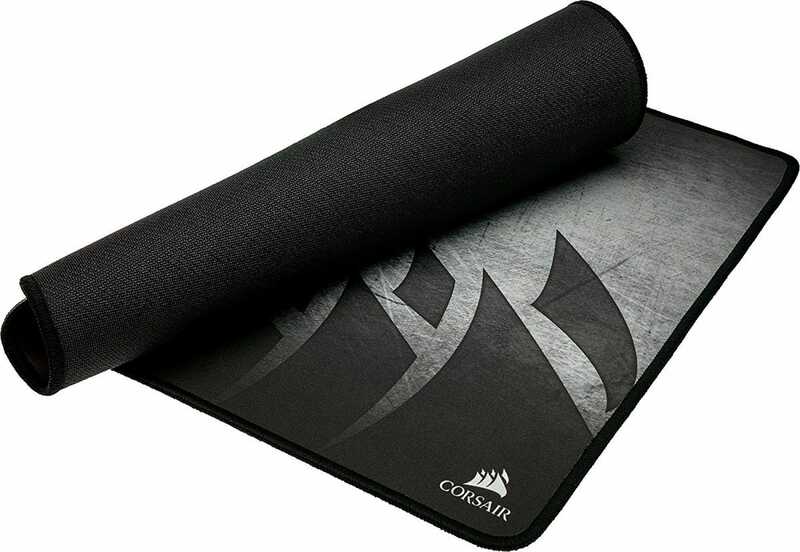 To be honest, there isn’t much that differentiates a “gaming” mouse pad from a non-gaming model when they’re both made of similar material with similar footprints. 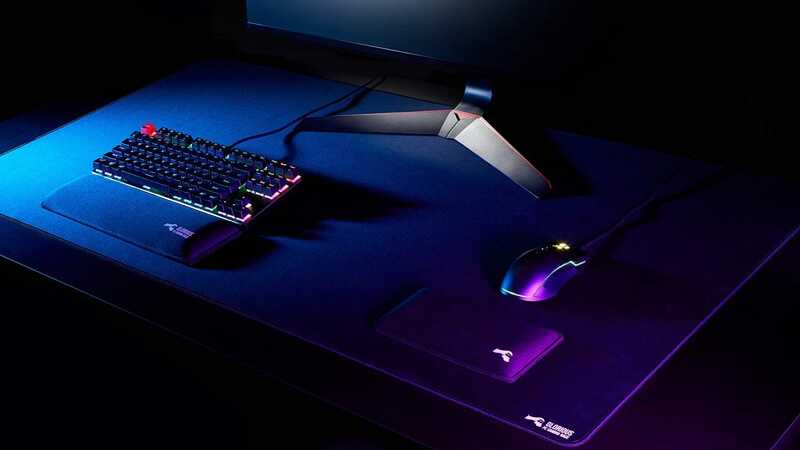 But Corsair’s oversized offering is specifically designed for super-accurate laser and optical mouse tracking, and your keyboard will enjoy uh, super-accurate placement too, I guess. The specific surface can even be input into Corsair’s mouse driver software for a customized profile, if you need that kind of extreme precision. The extended size offering includes a stitched anti-fray border, an anti-slip rubber bottom, and a 930x300mm surface area (36.6×11.8 inches), which is a bit shorter than some similar options. At 3mm it’s in the middle of the pack in terms of thickness. If you’re not a fan of the metallic graphic on the front, the MM200 model is offered in the same size with a more conservative black surface and yellow trim, but gives up the stitched edge. Notably, neither version is safe to put in a washing machine. The “Glorious PC Gaming Race” branding is nothing if not hyperbolic, and this gigantic mouse pad earns it. 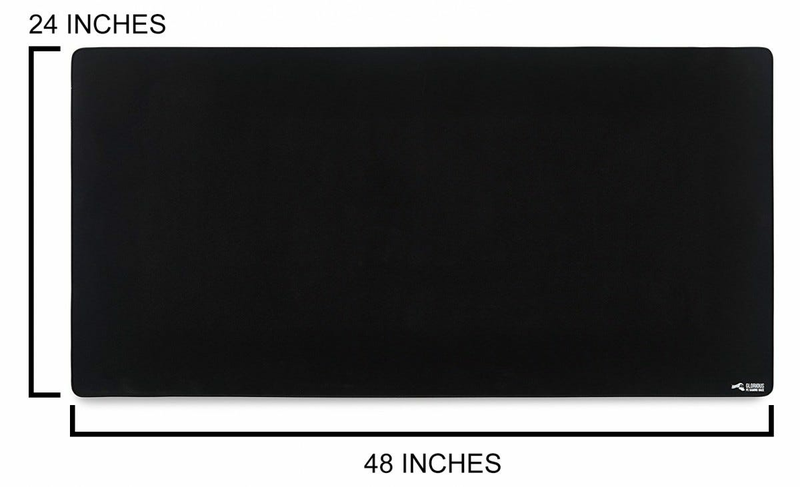 The largest version of the Extended Gaming Mouse Mat comes in at an absolutely massive four feet by two feet (about 1.2 by 0.6 meters), enough to completely cover a lot of computer desks, monitor, computer and all. To get anything bigger you’ll need to have it custom made. The surface is safe to machine wash, protected by stitching at the edges, and held in place with rubber underneath. The 3mm thickness should hit the spot for most users. With a $40 price tag it’s currently the most expensive option on this list, but anyone considering this massive pad is probably more than willing to splurge—after all, it’s no more than you’ll pay for some regular-sized pads from other “gaming” brands. Most of the pads in this size range tend to go with a somber black or grey color scheme. If you’d prefer your desktop to be a little more lively, Cmhoo offers a 900 by 400mm (35.4 x 15.7 inch) pad with no less than a dozen different designs to choose from which spread across the entire length. 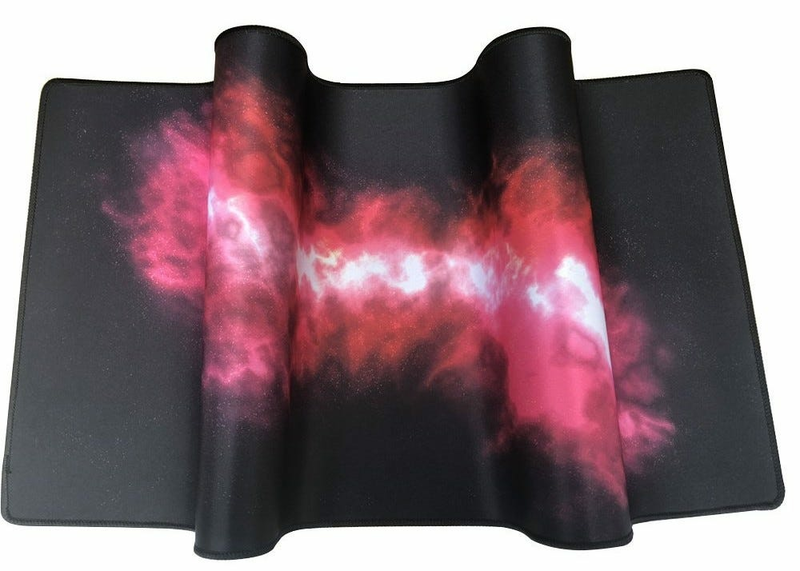 The prints vary from the more conventionally decorative maps and flags to starry space-scapes and dragons—it’s essentially computer desktop wallpaper for your desk itself. The pad is more than serviceable, with a rubber base and stitched edge, though it’s a bit on the thin side at just 2mm. And yes, even with the designs printed on the top, you can drop it in the washing machine if all that color causes you to spill a drink out of sheer distraction. It’s quite unusual for us to include a product in our roundups that isn’t available already but if you’re the target audience for this pad— and If you want a mouse pad the size of a bath towel, it’s fair to assume that you might be looking for something over-the-top—it’s worth book marking this article and making a note of this upcoming mouse pad. There’s no PC accessory seller better known for over-the-top than Razer and this pad really shows off their core design philosophy. The gaming gear vendor has been injecting every possible product with “RGB” LED lighting for the last couple of years, from speakers to coffee mug holders to, yes, mouse pads. The Goliathus Extended mouse pad, which didn’t rank among the conventional picks above thanks to a high price tag and a slightly smaller footprint, is getting an LED-injected variant later this year. 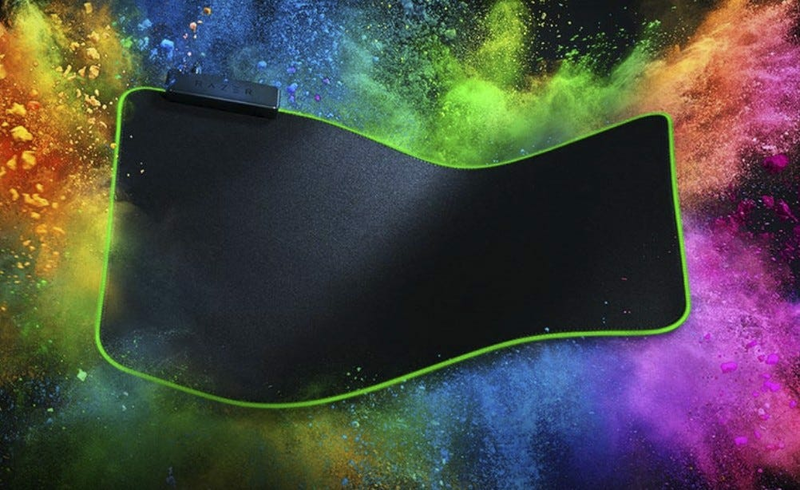 It’s the same cloth-based 920x294mm pad as the normal variant, with edge stitching and a rubber base, but it plugs into your PC to light up its edge with an RGB light show controlled by the Razer Chroma software. We don’t know when exactly it will be available, but we can make a couple of educated guesses: it will be much more expensive than the $35 non-LED version, and it won’t be machine washable. But don’t worry—we’ll update our list as soon as it’s released so nobody is left wanting.